Following an exceptional response to its first phase, Anwyl Homes will be building an additional 74 homes on a piece of land that borders its existing Abbeyfields development on Middlewich Road, Sandbach. The new phase will appeal to a wide range of purchasers, including families, young professionals and those looking to downsize. It will comprise an attractive mix of four and five bedroom detached homes, all with gardens and garages or off road parking, set within beautifully landscaped open green areas yet within easy walking distance of Sandbach town centre. Thoughtfully designed with modern living in mind, all homes are well appointed with a superior internal specification and boast individual style, charm and character. As part of the planning agreement, Anwyl Homes will make a number of Section 106 contributions that will be of direct benefit to the local community including more than £100,000 towards education in the local area. Construction is underway and the first properties on the second phase have just been released with prices starting from £324,995. A new showhome is also available to view. 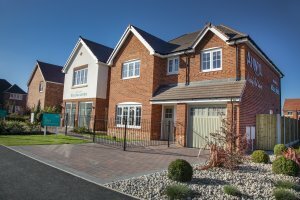 For further information, please visit the sales centre on Middlewich Road in Sandbach (CW11 1JD) or visit www.anwylhomes.co.uk.